Early in 1952, Hiller approached the Navy about authorizing construction of an evaluation quantity of Hornets. The proposal was accepted because it was felt that a revised Hornet might meet a Marine Corps requirement for an ultralight flying vehicle. By summer a fixed-price contract had been negotiated for delivery of five units, three to go to the Navy as the HOE-1. Impressed by the simplicity of the original HJ-1, the Army asked to take the remaining two (serials 53-4663 and -4664) under the designation YH-32. 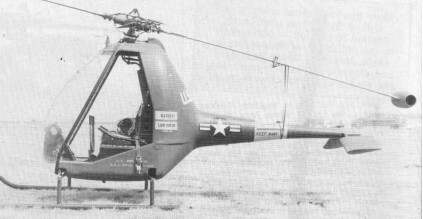 At the end of 1954, Army officials ordered a dozen more Hornets (55-4963 through -4974), and Hiller's own test and demonstration requirements brought the total of second-generation Hornets to twenty-five, including the three ULV gunships. The twelve aircraft were all delivered by late 1956. This evaluation quantity of HOEs and YH-32s marked the first production of tip-jet-powered helicopters in history, and the first procurement of such vehicles by U.S. military services. 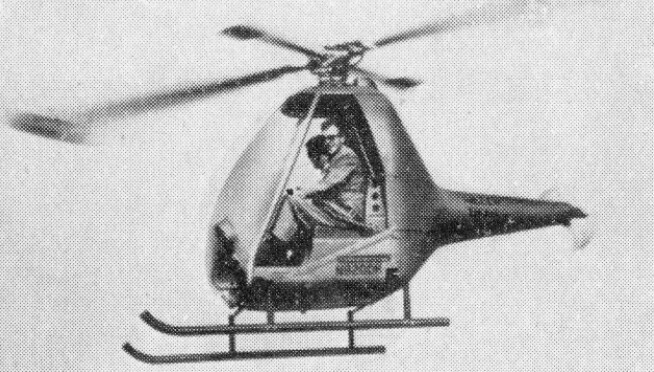 Although the new military helicopter shared the name and designation of the original HJ-1 "Hornet", it was an all-new machine with no commonality. It had lightweight skids, and it had rudder pedals controlling a single-blade tail rotor. 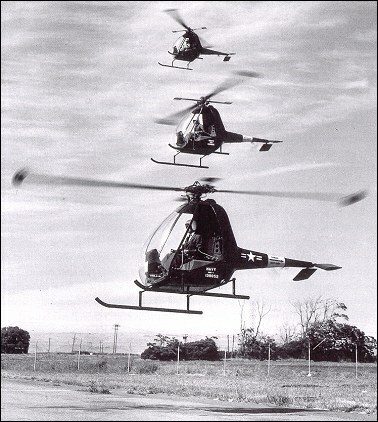 While not needed to offset torque, the tail rotor - which furnished crisper yaw control than was provided by the earlier Hornet's rudder - helped during autorotation and permitted rapid sideways flight as required by increasingly stringent military control requirements. The HOE-1/H-32 was designed by both Bob Anderson and James B. Edwards, the vice president of engineering, who had come to Hiller in January 1952 from Douglas Aircraft. The HJ-1 suffered a growth in size and weight. A larger cockpit, fiberglass body and tail boom (the first structural use of fiberglass in aircraft construction), and other changes raised the empty weight from the original Hornet's 160kg to 240kg, and the gross weight climbed to 480kg. As a result, the service ceiling fell from 3350m to 2100m. Even with 200 litres of fuel, the craft's range shrank from 65km to 45km, its maximum powered endurance at economy cruise being roughly thirty minutes. The joint military program by the Army and Navy had many extra-contractual changes that - including the dual certification programs - eventually consumed more than a million dollars of Hiller resources. The first of the HOE/H-32 series flew in September 1953, with deliveries to commence the following spring. The services did not receive them until the end of 1954, because these machines had been procured on a "certification specification" basis rather than on the standard "mil. spec." 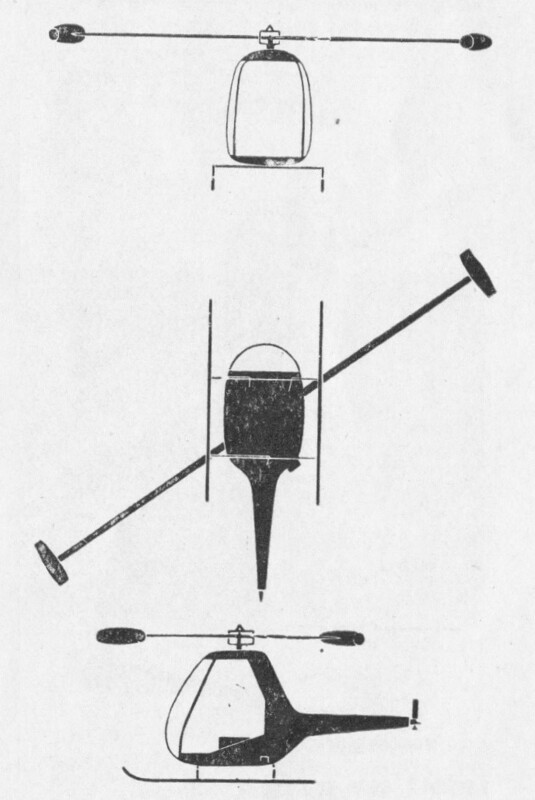 basis, and civil certification of the helicopter and its engine would take time, as both were new to the experience of the CAA. The 8RJ2B ramjet engine was a refined and uprated version of the unit Hiller had developed in 1949. Now eight inches in diameter and weighing 5.7kg, it produced the equivalent of 45hp. Manufactured by Ryan in San Diego under license from Hiller, the 8RJ2B was made out of lnconel X, a high-nickel alloy. Because Inconel X corrodes on contact with lead - then commonly found in automotive gasoline, which was a likely fuel for this engine - the engine's interior was coated with a protective ceramic material. By August, the 8RJ2B had logged 559 hours in the air, 2104 hours on the whirlstand, and 1545 hours in free airstream static tests. Its early teething troubles had been completely solved, even the once nagging problem of flameouts. If flameouts should occur, the engine now reignited itself so quickly that the pilot never perceived the problem. Another selling point was the remarkable portability and simplicity of the 8RJ2B. An untrained person could change a Hiller Hornet's engine in just three minutes with a screwdriver. Ramjet testing on the ground included static duration runs, which were a sore point with residents of Belle Haven and East Palo Alto. One test in March 1953 lasted 200 hours, while another the following February ran for 150 hours. At night an inversion would often form over the entire San Francisco Bay area, causing the bam-bam-bam of the whirling ramjets to skip over much of the local area and bounce squarely into the fashionable Atherton and Menio Park neighborhoods. Residents often telephoning the plant at Palo Alto to complain. The problem was significantly reduced in the spring of 1954 by construction of a circular barrier 5.5m high and 12m in diameter, which was designed to muffle jet engine noise. During the last days of ramjet certification in 1954, several overspeed runs were conducted on the whirlstand. At peak rpm, when the tip jet was subjected to as much as 14000 Gs (boosting its "weight" to some 80300kg), supporting bolts sheared and the 8RJ2B shot away through protective walls, acoustical barriers, and property fences before coming to rest some 150m from the test site. The test stand also departed the area, flying off toward San Francisco Bay. It was later recovered from nearby mud flats. The only known structural failure of a Hiller tip-power rotor, this test far exceeded expectations and overwhelmingly satisfied the stringent certification requirements. On October 28, 1954, the CAA awarded Hiller's 8RJ2B engine Type Certificate No. 280, officially approving it for commercial production and sale should Hiller so desire. Parallel certification for the "Hornet" helicopter was not granted. The reason was the cold drag problem associated with autorotation, as with the earlier HJ-1. The new military Hornets descended steeply at almost 18m/s, but their massive rotors stored so much energy that landings were simple after one became accustomed to the high sink rate. Hiller test pilot and marketing executive Robert Boughton found that whereas one would begin to flare 15 to 18m above the ground in a normal helicopter, the "Hornet" demanded that one begin pulling up on the collective a full two to three hundred feet off the ground. Enough inertia was stored in the tip engines to permit the pilot to touch down, rise into the air again, and land a second time. A solution to the unacceptably high sink rate was proposed to the military during development of the H-32 and HOE. The company suggested that the flameholders in the mouths of the ramjets be modified to function like controllable shutters. During autorotation, they could simply rotate shut to close off air-flow through the engine and greatly reduce cold drag. If one engine failed, the "Hornet" could be flown some distance to a safe landing, although it could not maintain altitude. An automatic low-fuel power reduction further enhanced safety by alerting the pilot to land while sufficient fuel remained to do so under power. Still, with range so limited and the possibility of fuel starvation so great, flameholder shutters were clearly a desirable feature. The military declined because its strict acceptance standards made no provision for such devices. Without them, the Hornet's autorotation proved unacceptable to the CAA, which otherwise found the diminutive craft satisfactory. Civil certification was accordingly denied. Failure to achieve this production license removed any possibility of Hornets reaching the private market, although it is doubtful that Hiller would have chosen to market a civil version in any event. On a warm day the Hornet could barely hover over a metre above the ground with two people and a full fuel load. The Hornet was able to run on a wide variety of fuels, but the fuel tank held only enough for 25 minutes flying or 65km range. The rotor needed to be spun to 50 rpm by a small motor before the ramjets would start. Normal operating speed was 550 rpm. Fuel pressure was then built up, fuel flow valves were opened, and the starter button was depressed to fire a spark plug in each ramjet. Ninety seconds later, the Hornet's rotor reached 450-500 rpm and away it flew. Pilots who had the chance to try it out reported generally pleasant and forgiving characteristics. The museum owning the only remaining flyable example of the 17 Hornets built received complaints from neighbours a mile and a half away when they last flew it. Typical range: 31 miles at 70 m.p.h. with full load.